IGN gets it! Well, almost. They buy a $450 projector, and build a screen for $80 to end up with a 9 foot TV! That’s what home theater DIY is all about, baby. Now, they didn’t exactly end up with HDTV, you can’t get a native HD projector unless you get close to the $2k range, but these machines can still produce an awesome image. And for some gaming goodness these guys desire? A 9 foot screen can’t be beat. 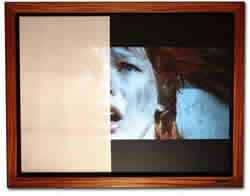 Da-Lite has easily installed electric screens that maintain stiffness. We all hate that limp noodle feeling, especially on our HT screen, right? Here’s Da-Lite to save the day. Matt Teevan showed us a slick motorized screen that, unlike many competitor screens, maintained excellent stiffness when fully extended. This is definitely a solution to check out if you wish to hide away the screen while not in use. Best of all its relatively easy to install, even for non techies. We’ve got more info from CEDIA about the mirage projector screen that works well with lots of ambient light. If you haven’t heard about this material, it could be the Front Projector Cave Dwellers’ dream come true. Shipping will probably bite your wallet, as the screen must ship as a full sheet – it’s very think and can’t be rolled up. These screens should be available in November. I’ve seen a lot of posts about outdoor theaters lately, and this is one of the best I’ve seen – if not the best. 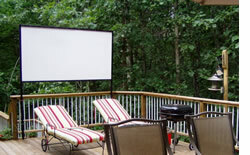 After constructing my “Woods Theatre” I decided to try out the Parkland Plastic for a deck screen. I bought a 4′ x 8′ sheet of Parkland from Menards for $13. I bought 8 firiing strips and painted them black. I used black wood screws to fasten a frame to both sides of the Parkland. I cut the length of the Parkland to 85″ for a 16:9 screen. I use bungee cords to secure the screen to the rails of my deck. I may just have to get into this outside (hmmm, does that make sense?) thing yet. I came across this quick tutorial that explains how to build your own screen for front projectors, using blackout (BO) cloth. You basically make a thin wooden frame and stretch BO cloth onto it with staples. This blackout cloth can be commonly found at cloth retailers. It is normally used to line drapes to block out sunlight. It’s another popuilar way to make your DIY home theater screen. 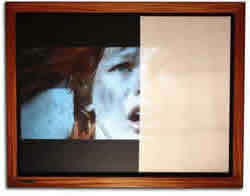 I have used parkland plastics material before for a cheap alternative for front projection screens. Sirquack at AVS (thanks Duck!) forums mentioned another Parkland product called Durotherm Lite panels. This looks like another useful alternative, and could be easier to mount. Look for it at your local home improvement store. This reviewer really liked this screen, it looks like a great value for the quality, and it was wife-unit approved! 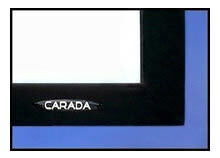 Carada is definitely on the htdude approved screen list. The Screen Innovations Mirage Screen features a patented high-contrast filter that covers 60% of the screen surface. This filter allows the projected image to be reflected by the screen and effectively absorbs incidental light from other angles from such sources as windows and room lighting. As a result, the screen is virtually unaffected by ambient light. Wow, just when I got used to sitting in my cave to watch the big screen every night! At least the product won’t be available until later this year, so I’ll have time to adjust my pupil training. This should extinguish many arguments with wife-units, and allow for front projector home theater systems to peacefully co-exist in the domesticated home. Schwing! One for the boys.